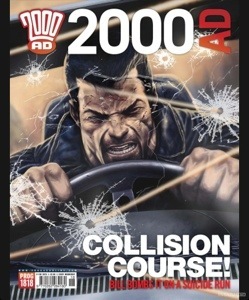 In this issue of 2000AD we get a nice mystical piece involving Judge Dredd, Savage & more! Judge Dredd moves away from the sci-fi, and into magic. There’s a returning character from an old prog and a nice finish with a piece of classic 2000AD humour! I like these one shot stories – they give you another look at Mega City One. The magic side is excellent and the art fits well! It looks like we’re getting near the end of this particular chapter of Savage, and theres lots of action! It works out very well with some nice pacing and artwork. Savage has really grown on me and I look forward to it each week. Ampney Crusis investigates gets stranger and stranger! But I’m gradually getting into it. The art can be a little screwy, but I’m getting there! Computers, explosions and martians – it’s all there! In the Red Seas, things seem to start going wrong for our heroes, but the action has tightened up and the story is really pulling together. The mutant uprising continues in Strontium Dog, with some claustrophobic action which opens up towards the end. Johnny Alpha is an excellent character, and it’s great to see him in a different sort of action with a new(ish) cast of characters!